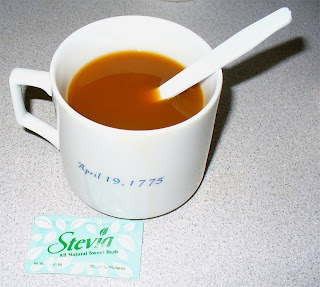 Growing Ideas with Johnny's Selected Seeds: Stevia: How sweet it is! If you've hit your favorite local coffee shop lately for a caffeine fix, you've probably noticed little green packets on the condiments counter near the soy milk, half and half and sugar. Most likely you're looking at a natural, herbal sugar substitute known as Stevia. In its powder form, Stevia more than holds its own vs. artificial, chemical-based sweeteners in coffee or tea. It's not just for hot beverages, however. The leaves of Stevia may be used fresh, dried, or as a liquid to sweeten just about any food. The plant, a native of South America, produces leaves that are said to be 15 times sweeter than sugar. Here's an excellent article about Stevia from Mother Earth News. It covers the history of Stevia, nutritional and dietary aspects of the herb, and concludes with several recipes. You can easily grow your own Stevia. It's a good herb for containers. Last winter, one of our international salesmen successfully grew several Stevia plants under a grow light in his office. Stevia plant at Johnny's Research Farm. Description: Stevia is a tender perennial hardy in USDA Zones 9 and 10, or where temperatures do not fall below freezing. When grown as an annual, it reaches a height of 18-24 inches with bushy sideshoot growth. A native of South America, Stevia has been used as a natural sweetener for over 1,500 years. Today, the remarkably sweet leaves are used as a sugar substitute throughout the world. Virtually calorie free, sweeteners made from Stevia do not raise blood sugar levels, and are generally safe for diabetics. Parts used: Fresh and dried leaves. Culture: Recommended indoor planting method: Start seeds 6-8 weeks before last frost date. Sow shallowly in a well-drained soil mix in flats at a temperature of 68-75ºF (20-24ºC). Transplant to 3" pots when seedlings are large enough to handle. Do not over-water. For bushier plants, pinch back growing tips every few weeks for the first 1-2 months after germination. 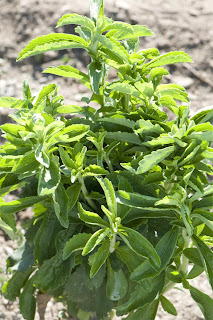 Outdoor planting: Stevia generally does not tolerate temperatures below 45ºF (9ºC). After all danger of frost has passed, transplant outside 12" apart. Stevia is also an ideal plant to grow in containers as a houseplant, or in the greenhouse. For container growing, choose a pot that is at least 14" across, and provide soil that is well-drained. Maintain even soil moisture, and provide shade in extreme heat. 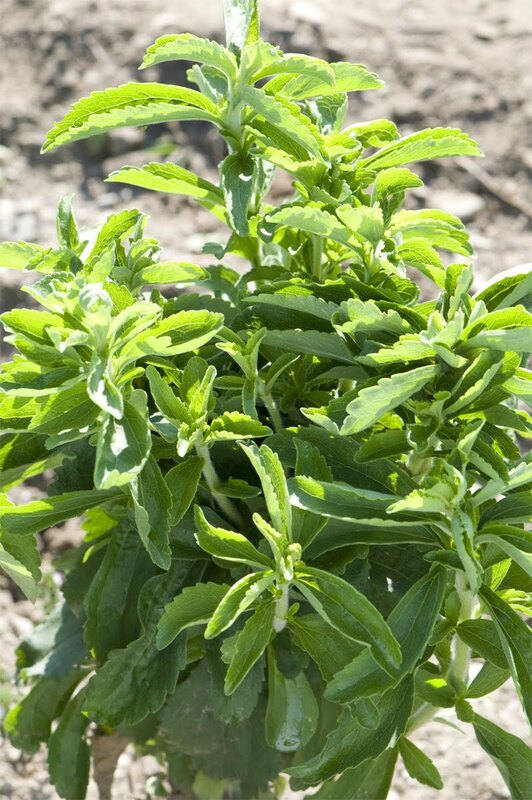 Light/Soil/Water Requirements: Stevia performs best in average, well-drained soil in full sun. Avoid overuse of nitrogen-rich fertilizers, as they cause the plant to produce large leaves with little flavor. Do not over-water, especially when being grown as a container plant or when transplanting. In extreme southern areas and when growing in containers, afternoon shade may be need. Pest/Disease Problems: Carefully watch for any signs of insect damage to the leaf. Whiteflies and leafhoppers may pose problems. Harvest: Pick in the morning and before flowering occurs for highest sugar content. Leaves may be harvested throughout the season once the plant has become established, with the main harvest occurring in September or October. Fresh or dried leaves are delicious in salads, sauces, and beverages. To dry, hang small bunches of stems in a well-ventilated, dry area out of direct sun. Dried leaves may be ground into powder for storage. Fresh leaves can be used to make a liquid sweetener by steeping one teaspoonful of dried leaves in one cup of boiling water for 5 to 10 minutes.